Roald Dahl's amazing tale is now Chicago's golden ticket! It's the perfect recipe for a delectable treat: songs from the original film, including "Pure Imagination," "The Candy Man," and "I've Got a Golden Ticket," alongside a toe-tapping and ear-tickling new score from the songwriters of Hairspray. Get ready for Oompa-Loompas, incredible inventions, the great glass elevator, and more, more, more at this everlasting showstopper! Entertainment Weekly raves "Broadway's Big Treat" and NPR exclaims "You'll have a ball!" "...The show's unqualified hit is its way of rendering the Oompa-Loompas, Wonka's diminutive factory workers. The performers are dressed in puppeteer all-black, so that only their faces are visible beneath bright orange wigs. Kneeling, they use their black-gloved hands to manipulate the short arms and legs of tiny puppet bodies. The puppetry was devised by 2015 MacArthur fellow Basil Twist, the Oompa-Loompas' jaunty choreography by Joshua Bergasse." "...Not only did Weisberg make the character of Wonka more his own but the story itself also adds some twists. Taking place in modern times, it provides commentary on today's obsession with technology and social media fame. Gum chewer Violet Beauregarde, for example, is a self-proclaimed "queen of pop" famous on social media for her gum-chewing talents. Mike Teavee, who is obsessed with television in the book, actually obtains his Golden Ticket in the musical by hacking Willy Wonka. The show's take on technological themes also fits with the modern way it's staged, which includes many high-tech LED screens that add color and effects to the whimsical story." "...Its performers are indeed at the top of their games. And they loft this production into the starry skies that Charlie and Willy Wonka eventually rise through in one of the shows' many show-stopping, heart-stopping moments." "...Along with a letdown of eminence and danger, the characterization is inconsistent. In Act I, Wonka�s an Everyman who just so happens to own a renowned chocolate factory. In Act II, he�s a ham spouting zingers and groaners (�If you fall in [the chocolate river] you could end up seriously fudged�). Never in Act I, however, do we get the sense he�s a closeted extrovert. Rather, it appears the first-act Wonka has been replaced by someone else during intermission." 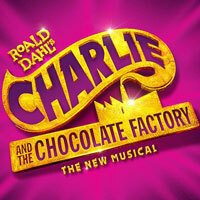 "...Directed by Jack O�Brien, Charlie and the Chocolate Factory is a bit more salty/sweet than tearjerker gratifying. But it mostly hits its high points and is an entertaining night at the theater. Much more for kids or at least the kid in all of us." "...The second act runs longer but does contain some inventive child endangerment (who knew squirrels could be so vicious to ballerinas?). The show's most inventive and delightful moments come with the introduction of the chorus line of tap dancing Oompa Loompas. Joshua Bergasse's choreography of these merry madcap midgets is basically the show's sole saving grace. The 16 songs, with music by Marc Shaiman and lyrics by Shaiman and Scott Wittman are instantly forgettable, nearly forgotten as they are sung. The two standouts in the score are "The Candy Man" and "Pure Imagination," written by Leslie Bricusse and Anthony Newley for the 1971 film. Those songs possess true staying power. Jeff Sugg's projection design is the show's other highlight, but who wants to come out of a musical humming the projections." "...Overall, it is a standard musical theater pleaser. Spirited, fast-moving, colorful, and with an added bit of updated techno and plenty of comedy. However, there are a few obstacles in this production, although I suspect theater-goers will choose to overlook them for the overall experience. And that experience really is terrific. Unless, of course, you are a die-hard Willie Wonka fan and cherish the much more sophisticated storytelling and messaging of the original book and movie."